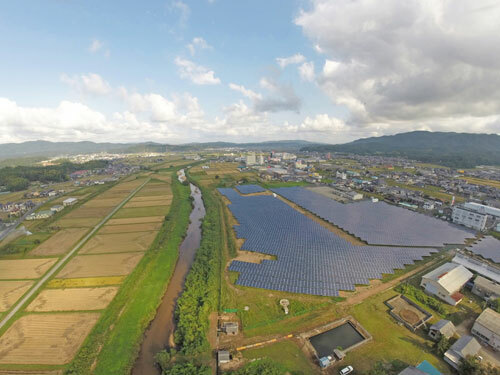 Chow completes its first solar farm in Japan. Ready to start commercial operations in Q4 this year. CHOW announces the progress of its planned 18 MW solar power projects in Japan. The first project, with a capacity of 4.019 MW, was completed and will be ready to operate commercially by Q4 this year. Confident that the remaining 14 MW will be finished by the end of this year, Anavin Jiratomsiri, CHOW CEO, said that the company is ready to move this business forward, having just set up a subsidiary in Japan. Anavin Jiratomsiri, CEO of Chow Steel Industries Public Company Limited or CHOW, a major steel billet manufacturer and distributor in Thailand, disclosed details of the progress of its solar power project development in Japan. On October 20, 2014, construction of its first project in Kyoto Province was 100% completed with an installed capacity of 4.019 MW. The system is currently in its testing phase to ensure that it meets quality standards and can efficiently generate electricity. The plant is now waiting to be connected to the grid and begin commercial operations by selling electricity to the Kansai Electric Power Company (KEPCO). The project has already obtained a Power Purchase Agreement from KEPCO at the rate of 40 JPY/unit for a period of 20 years. Income is expected by Q4 this year. The rest of the 14 MW are under construction and will be commercially operated by 2014 as planned. CHOW operates its solar business through its subsidiary, Chow International Co., Ltd. Another subsidiary, Premier Solution Co., Ltd. is the project developer that sources land, secures all necessary land and construction permits, secures solar modules and other components, and provides construction service. Anavin also elaborated that the company is ready to further expand its business in Japan, where there is stiil more that 29,000 MW of capacity available for renewable energy projects. With a team that has extensive experience in the solar business, the company has set up an office in Japan. The company has 3 business models for its renewable energy business in Japan: Self-invest model through its subsidiary, which is the model used for this 18 MW project; Turn-key model to sell the project to a business partner, which is used for the 23 MW project being developed for Eastern Printing PLC or EPCO by Premier Solution Company Limited (PSCL), a subsidiary of CHOW; and lastly, the Joint venture model, which is used for the recently signed Shareholding Agreement with Ratchaburi Electricity Holdings Group or RATCH for two solar power projects with a total capacity of 33 MW. CHOW expects to see simultaneous progress on all three fronts very soon. CHOW's CEO continued to note that the company's plan to expand into the solar power business is part of its strategy to invest in high potential businesses that create long-term stable cashflow, which will reflect strong growth and will result in higher value for its investors.